This page and its instructions need further review. Please don't use these methods until this notice is removed. This method is similar to the old method for updating Joomla versions. Here we want to replace the existing program files with the files from the update archive. The advantage of this method is that it will work on slower shared hosts. The disadvantage is that it requires more work by the system administrator. This method can also be used to repair a site where the automatic update failed due to a server timeout. There are two ways you can do this. Copy the archive file to the root directory of your site and unpack the archive. The update archive will be named something like Joomla_2.5.0-Stable-Update_Package.zip. Note that you need to tell the system to replace any existing files. For example, in GoDaddy.com, use the FTP File Manager to upload the update file and then use "Unarchive" to unpack it. Check the box "Overwrite existing files". If you don't have the ability to unpack the archive on the server, create a temporary directory on your local machine and unpack the archive file there. Then FTP these files to the root directory of your site, overwriting the existing files. At this point, you should be able to log into the back end of your site with the new version installed. However, you are not done. 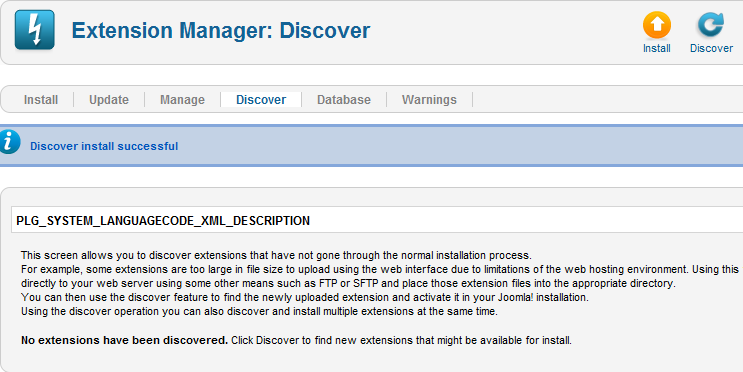 Navigate to Extension Manager: Database. You will initially have Database problems when you check the Database, similar to the screen below. This is expected. Click on the Fix icon to correct the problems. Now the screen should show that the database is up to date. 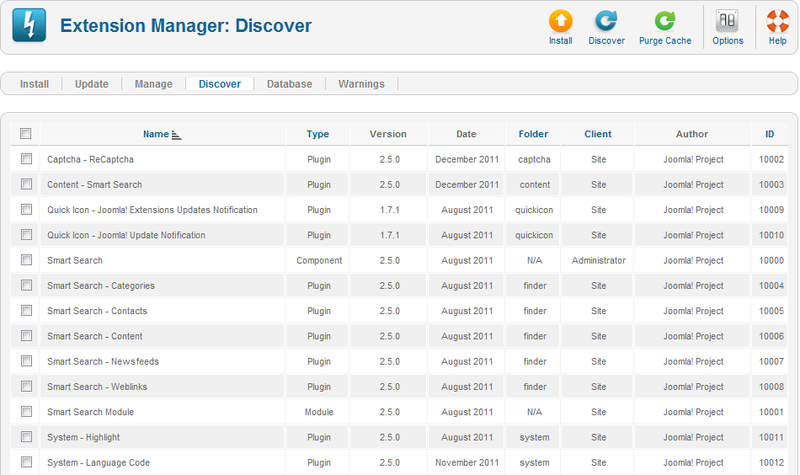 Navigate to Extension Manager: Discover and click on the Discover icon in the toolbar. If the updated version has new core extensions, new extensions will be listed, as shown below. Select all the extensions and click on the Install icon in the toolbar. The system should display a success message similar to the screen below. Use extreme care when deleting files and folders from your Joomla installation, deleting the wrong file or folder may break your site! Using phpMyAdmin or a similar tool, edit the row of the #__extensions table where the id column is '700'. (Note that the table prefix will be different in your site. For example, if your table prefix is "jos_", then the table will be called "jos_extensions". In the manifest_cache column, you will see the old version in the text (for example, "version":"1.7.3"). Change this to the new version (for example, "version":"2.5.0"). Be careful to not change anything else in this column. 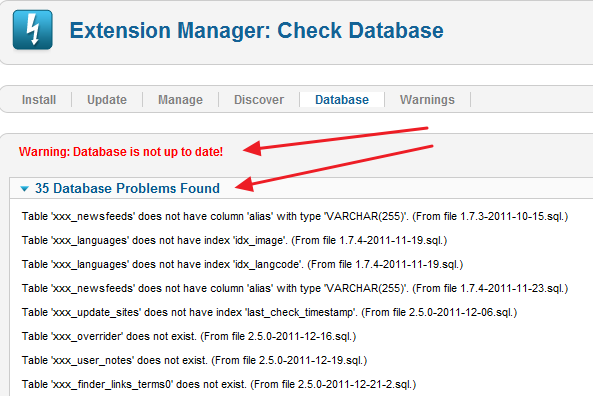 To check that this was successful, navigate to Extension Manager: Update and click Check for Updates. You should not see the current Joomla version in the list. At this point, your site should be updated correctly. This page was last modified on 4 March 2015, at 09:29.